In less than one month, Georgia voters will head to the polls and cast their ballot in what will be one of the country’s most consequential race for governor. Democrat Stacey Abrams, a former state representative, could become the first black woman governor in American history, bringing with her a progressive agenda that pushes back against the Trump administration’s draconian policies. Or, the race could go to Secretary of State Brian Kemp, a Trump-endorsed Republican. Abrams and Kemp are neck-and-neck in the polls. To learn more about what’s going on and what voters can do before the general election, Jezebel spoke to Allison Riggs, senior voting rights attorney at the Southern Coalition for Social Justice, about Kemp’s troubling voter rights policies that created Georgia’s registration backlog. JEZEBEL: Why does this voting backlog exist, and what does it mean for voters? ALLISON RIGGS: Because Kemp worked as the state’s chief election officer and is now running for governor, some of the decisions he made in that role are becoming the subject of the gubernatorial debate. Two things that he’s done that are problematic are: First, it wasn’t law, but it was a protocol or policy that he required an “exact match” between voter registrants’ applications—like the name, the spelling of the name, the address, and the last four of the social and the date of birth and the driver’s license number—there was no room for a mistake or a misreading. This was something that legal groups challenged in 2016 and they settled the case in 2017. 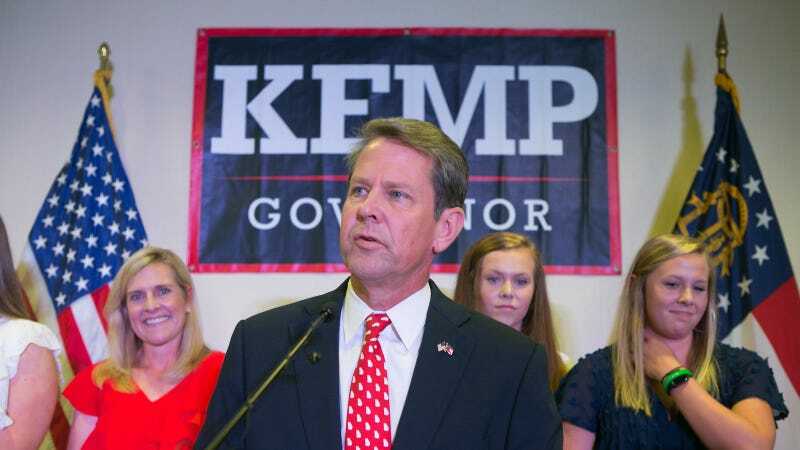 After they settled the case, the Georgia legislature codified in law the practice that Kemp had been using just as an administrative protocol, which is mind-boggling. That issue is back up for debate. The question is: Is this good policy? There’s no reason a voter should only have a certain number of days to correct an issue that they may not even know about. The protocol, which is now essentially the same thing as the law, was shown to disproportionately impact voters of color. It leaves no room for human error and it leaves insufficient room for correcting mistakes at a later date. It’s unnecessarily suppressive. I mean, there’s no reason that a voter should only have a certain number of days to correct an issue that they may not even know about. I think the reason this is up for debate is, the other candidate, [Stacey] Abrams, would have a more forgiving approach to processing voter registrations and I think that it’s a real important policy question and distinction between the two, and I think Georgia’s exact match requirement is problematic under the National Voter Registration Act. The other thing that’s always concerning is how a state conducts what it calls its voter list maintenance, and Ms. Abrams has suggested that Mr. Kemp has overseen an overly aggressive list maintenance process and overly purged inactive voters. There’s a real difference under federal law between what federal law allows and what federal law requires. There’s a Supreme Court case this term, the Husted case, that suggested that federal law may allow states to purge inactive voters after a certain period of time. But just because it allows it, doesn’t mean states should do it, or it’s a good idea. There’s no data to suggest that there’s any sort of significant voter fraud problem. The reason these voters are getting purged is because they’re inactive, so no one’s voting in their name. They’re inactive. That’s why they’re getting purged. So it’s sort of circular logic to say that we need to purge voters because they are inactive because of the threat of voter fraud—that someone would go and pretend to be that person and vote in their name—because that’s just not happening. It’s another example of where, in making policy decisions, Mr. Kemp could have erred on the side of voters and could have erred on the side of ensuring eligible voters didn’t get their registrations rejected or their registrations purged, and he chose a different route. And I don’t know that there will necessarily be any legal consequences at this point on the purging piece, but I think there probably will be legal consequences on the “exact match” piece, and both are bad policy and bad for democracy. What kinds of things can get a voter left off due to the “exact match” policy? It requires the exact spelling to match, and numbers to not be messed up. I guess what I would say is, from having dealt with voter registration issues so many times—peoples’s handwriting causes problems. You could be triggered as a mismatch, a not exact match, if your “L” looks like an “I” in your handwriting. Someone is going to be inputting what you have, most often, handwritten on your registration application. And that’s why exact match is such a bad idea. Because you could have an error in the inputting, or misread your handwriting—there’s just no room for natural human issues. Georgia’s “exact match” law says that voter registration applications that fail the exact match have 26 months to correct the mistakes, and can vote within that window if they have proper identification with them—what does it mean for a voter’s registration to be pending or on hold? Pending [means] there’s still some issue with their registration, and there’s something that they need to bring in order to finalize their registration. What we would be worried about is voters not knowing that there’s been some issue with an exact match, and so going to vote but not having the documentation they need to move from pending to actual. It’s still another hurdle that shouldn’t be necessary. It’s a remnant scar from so many hundreds of years of discrimination against voters of color. What’s a better model for processing voter registration? So I’m in North Carolina. If there’s some issue with a voter’s registration, generally speaking—so my name is Allison Riggs, and if the “s” at the end of my last name looked like an “f” instead, someone who was inputting it who saw that the address was right, and that my driver’s license name was right—they would still process that. They might send me a piece of mailing to confirm, but they would still process it. There’s common sense ways that you could say, “Alright, this person matched on address and date of birth, but there was one number off in their driver’s license number. I’m still going to process that registration.” I know counties in North Carolina that will make calls to voters just to [confirm] we got your voter registration, and your last name is spelled, “Riggf,” and I’ll be like no, it’s spelled like “Riggs.” So reasonable things that election administrators can do: one is use common sense, and two is be willing to do a little outreach to voters, neither of which takes a lot of time, and neither of which in any way undermines the accuracy of the voter rolls. According to the AP, nearly 70 percent of the voter rolls on hold in Kemp’s office are black. Democrats say that he’s actively suppressing minority votes, while Kemp’s office blames the backlog on the New Georgia Project, an organization that registers voters, founded by Abrams in 2013. What do you think of Kemp’s claim? There’s a lot of political science and academic research that would contradict what Kemp’s office has argued. There’s a high correlation between socioeconomic status and ability to successfully navigate bureaucratic forms. If you live in an area where there’s been discrimination against a specific group—and in Georgia that’s black voters—that discrimination has lasting consequences even to today. We see in North Carolina, for example, that voters of color are disproportionately represented in, we call it, an “incomplete status” on the voter registration forms. That’s actually common across the South and it’s a remnant scar from so many hundreds of years of discrimination against voters of color. The Georgia voter registration deadline for the general election was on Tuesday. There are people who might not even know that their status as registered voters is pending. What can those people do to ensure they’ll be able to vote? If they submitted a voter registration and the question is, there wasn’t quite an exact match, it depends when they filed or submitted their voter registration. What I would tell voters is find our your registration right now. Under the exact match law, there may be time to fix any problems, but if they’ve been purged that’s a harder question, because obviously the registration deadline has passed. I think, truthfully, if they’ve been purged just from inactivity, they can try and argue about that, but they may be out of luck. It’s certainly one of those things that we want to document, right? People like Mr. Kemp always say, “Oh, this is just left-leaning groups trying to make an issue out of something and screaming about a problem that doesn’t exist.” Sometimes we know the problem exists, but it’s hard to find people willing to share their stories about it. In either the exact match issue or the improper purge issue of an inactive voter, we need voters to understand what their status is. And it’s easier to find information about a problem before election day. If voters call their County Board of Elections now, in advance of the election, they’re much more likely to get a clear answer about what went wrong, and on the exact match side, there may be a chance to fix the problem so they can still vote in November. But there’s lots of voting rights attorneys and groups that if voters identify that they have been purged because of inactivity, purged because of some other reason, or if there’s some issue with registration that the County Board won’t hear, voters should reach out to groups like mine and other groups that do voting rights work because we would be happy to help them navigate the system and happy to help them find out what the issue is.